Cut the following lengths of Accu-Flex® professional-quality beading wire: one 20-inch length, one 22-inch length and one 24-inch length. String onto the 20-inch length of beading wire: one crimp and the small loop, above the top loop, on the 3-loop side of one 16x7mm end bar. Pass the beading wire back through the crimp. Pull the beading wire to create a small loop leaving about 1/4 inch of beading wire on the end. Crimp, then trim the excess from the short end of the beading wire. Finish with a 4mm crimp cover. String onto the beading wire forty one sets of; one red coral 8mm round pearl and one transparent gunmetal #11 seed bead. 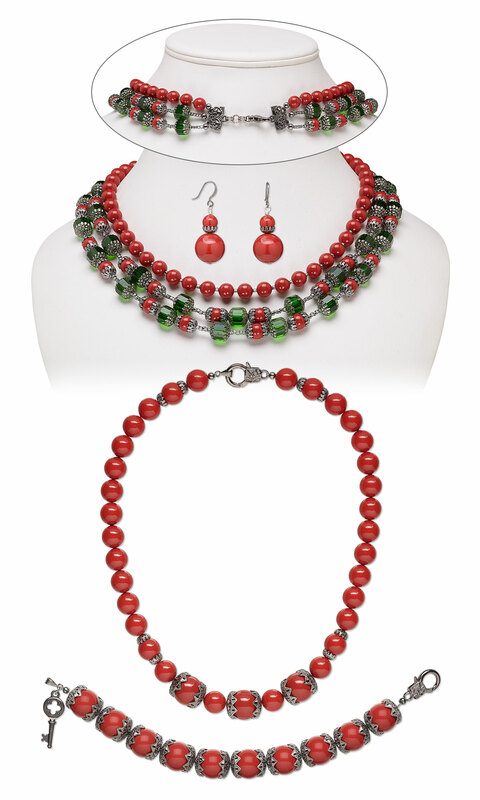 Continue to string one red coral 8mm round pearl then repeat Steps 2 and 3 to secure the strand. String onto the 22-inch length of beading wire: one crimp and the middle loop on the 3-loop side of the end bar then repeat Step 3. String onto the 24-inch length of beading wire: one crimp and the small loop, below the bottom loop, on the 3-loop side of the end bar then repeat Step 3. Repeat the sequence in Step 6 to string eight sets. Continue to string five transparent gunmetal #11 seed beads, the small loop, below the bottom loop, on the 3-loop side of the second end bar then repeat Step 3 to secure the strand. Pass one 6mm jumpring through the single loop on the opposite side of the first end bar and two 6mm jumprings then close. Repeat to attach a second jumpring creating double jumprings. Using 6mm double jumprings attach the swivel lobster claw clap to the last set of double jumprings. Cut one 21-inch length of beading wire. String onto the beading wire one crimp and the loop on the abstract design lobster claw clasp. Pass the beading wire back through the crimp. Pull the beading wire so the crimp rests snug against the clasp leaving approximately 1/4 inch of beading wire on the end. 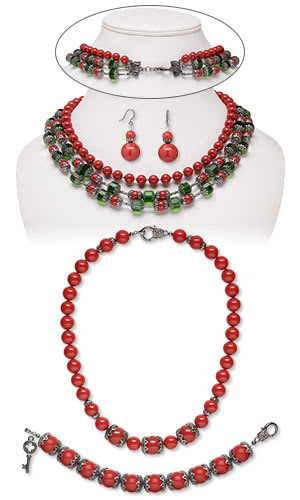 Repeat the sequence in Step 3 in the opposite direction to string the second half of the necklace. Repeat Step 2 using one 7x4mm bail to secure the strand. Cut one 9-inch length of beading wire. String onto the beading wire: one 15x5mm fancy round, one red coral 16mm round pearl and one 15x5mm fancy round. Repeat this sequence to string a total of ten sets. Pass one 6mm jumpring through the loop on the bail and one 29x11.5mm quatrefoil key charm then close. Form a wrapped loop creating a pearl drop. Open the loop on one fishhook earwire. Pass the loop through the wrapped loop on the pearl drop then close. Repeat Steps 1 and 2 to create a second earring.